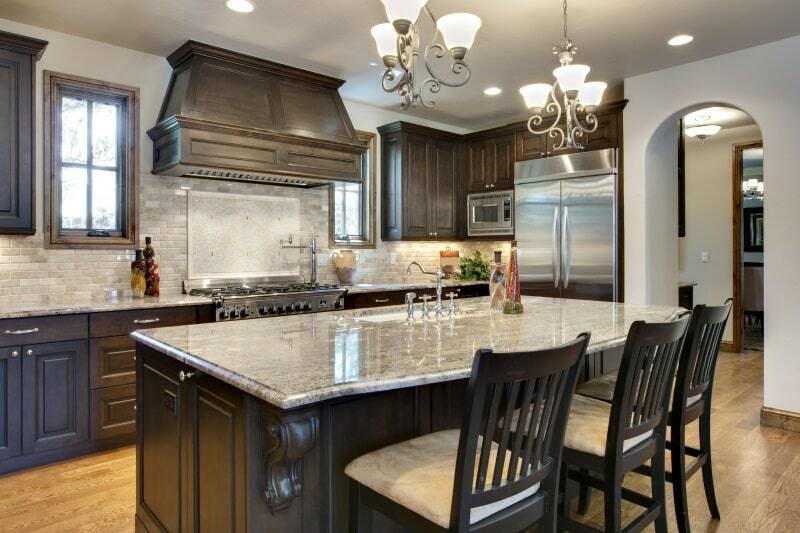 Bonjour and welcome to Art of the Home gallery of kitchen island designs! We hand-picked them for you…hope you enjoy the visit! 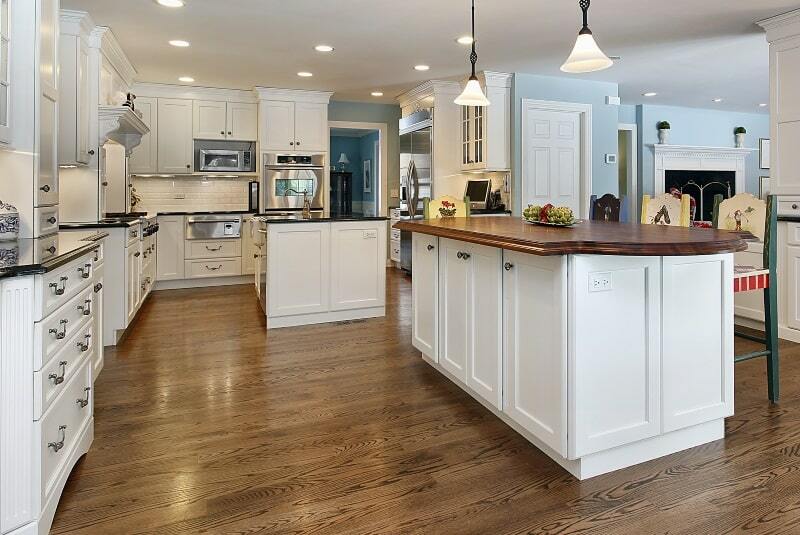 Kitchen island designs is a fairly new concept but its premise is centuries old. 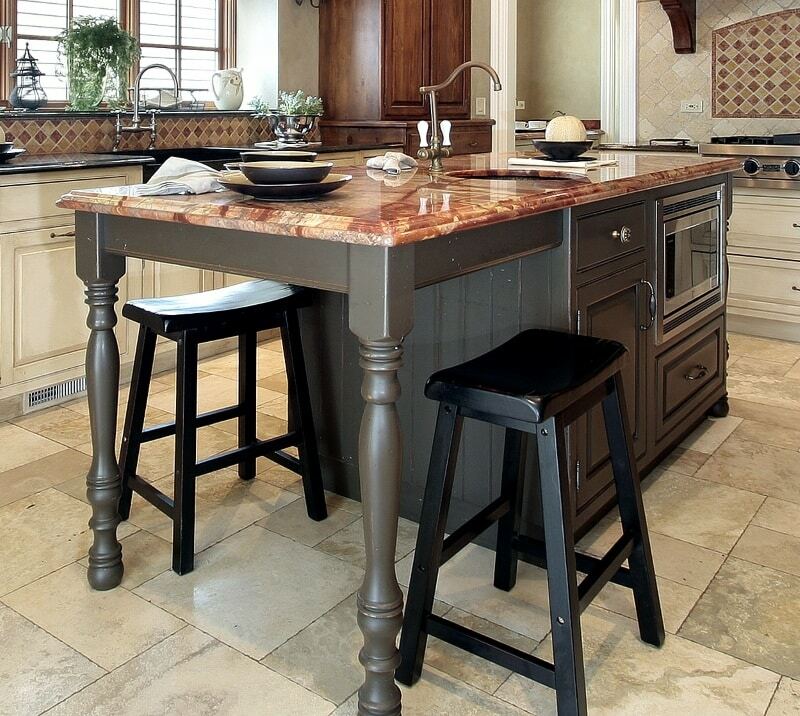 Kitchen islands remind us of the large kitchen table that took center stage in most French kitchens in the old days. No matter how small or large your kitchen was, how rich or poor you were, the kitchen table shared in all family moments and like a wise queen caringly reigned over the heart of the home. In some ways, I feel that’s the raison d’être of today’s kitchen island. We all know the expression, “if these walls could talk.” How about, “if these kitchen islands could talk” — what an interesting novel that would be! 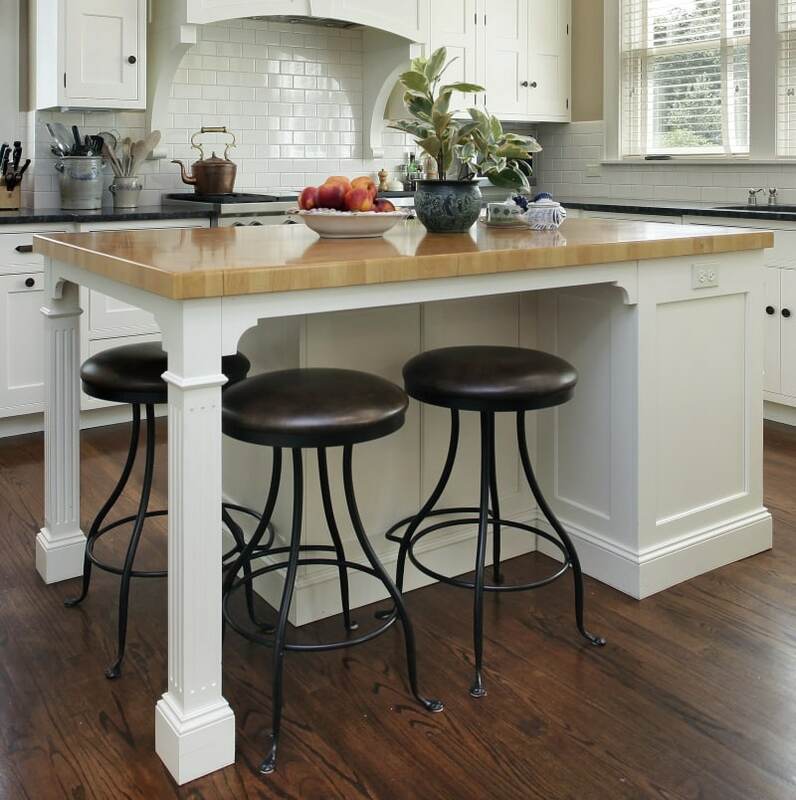 A kitchen island in the US, or wherever you may be in the world, is where so much is happening so you need to keep this in mind when considering various kitchen island designs. It can be where your day starts with a good breakfast, where you prepare a quick weekly dinner or a five-course meal for a special occasion. It can also be where you slow down with family or your closest friends with a coffee, tea, or a glass of wine. 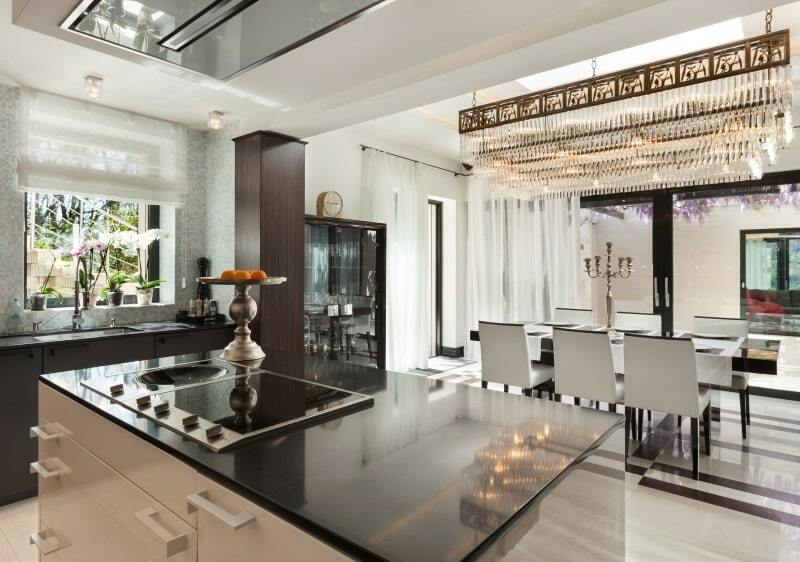 So when you browse through the kitchen island designs we selected for you, it is very important to think about how your kitchen island will integrate into your lifestyle – think about flow, functionality, style, and how it makes you feel. So here are beautiful kitchen island designs we handpicked for you, we hope you will find one that inspires you. Enjoy and beautiful day to you! The Little Plus: the space under the butcher block countertop to tuck in the kitchen stools. You may lose in storage but it’s a way to include a kitchen table and you also gain in overall floor space. 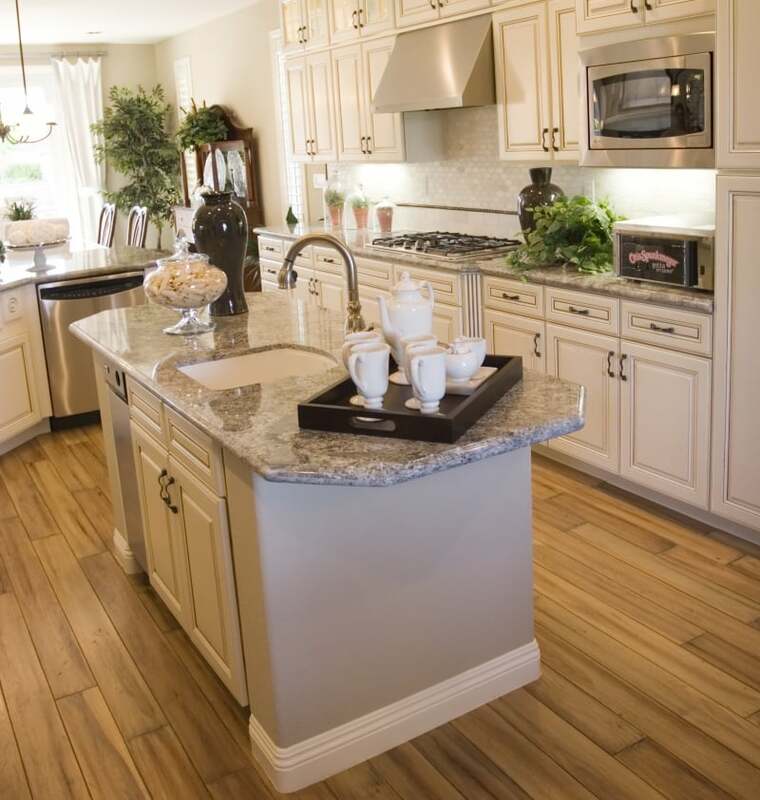 The Little Plus: the star of the show is the granite countertop. The beauty of its pigment is in perfect harmony with the dark olive green island, the travertine tiles and the maple buffet deux corps in the corner…wow! The Little Plus: the two-tone cream and black modern kitchen island ties in perfectly with the beige marble floors and dark cabinets. The pewter cake plate used as a fruit holder (fruits are a great way to add color to any decor…) is the perfect shabby chic companion to this modern kitchen island design. The Little Plus: the pale sage green of the kitchen island cabinets and their rustic oil rubbed bronze hardware. 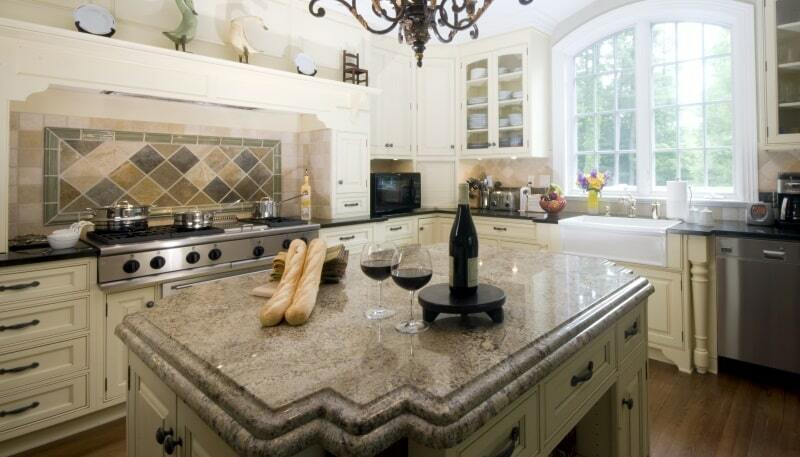 This makes this granite kitchen island feel like a one-of-a-kind piece of furniture. She is also a great companion to the creamy white cabinets in the rest of the kitchen. 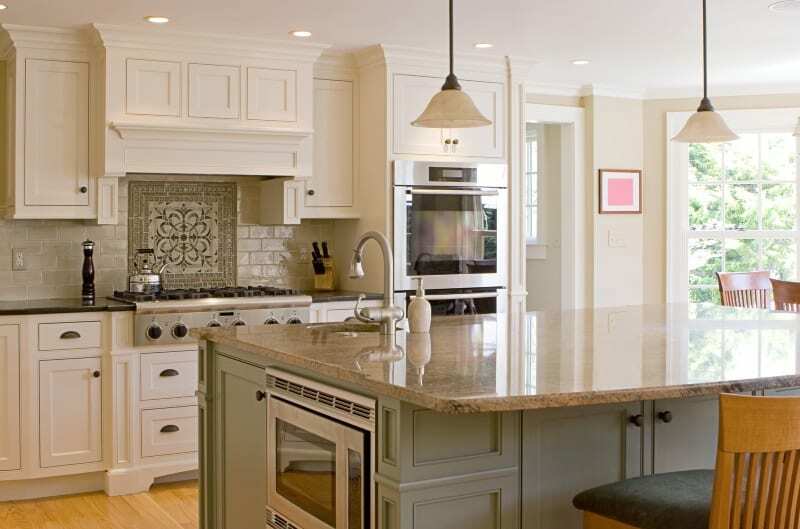 The Little Plus: the center Island supported by two narrow rectangular pillars painted in light gray recalling the granite countertop. The Little Plus: the classic corbel design that holds the grey granite countertop and the farmhouse faucet style is just the right accents to give this kitchen island a sophisticated vintage feel. The Little Plus: the microwave tucked away on the side of the kitchen island that opens up other possibilities such as allowing for a gorgeous backsplash medallion under the range hood.